Chiromyzinae Archives - What's That Bug? Currently viewing the category: "Chiromyzinae"
2 years ago I was in Leura, a small town in the Blue Mountains just west of Sydney Australia, when I saw a number of these bugs on a concrete driveway. Next to the driveway was a small bamboo grove which seemed to be the source of the bug. The maximum size was about 35 mm but most were about 20 mm long. None had any feelers/antennae. They tended to move towards a persons shoe if one went within a metre of them. It was 11 am in mid April which is mid autumn (Fall) here. It was an overcast day, not raining, but with high humidity. Leura is 90 km (55 miles) from the Pacific ocean and is generally at 950 metres (3000 feet) above sea level. The vegetation is lush. That is wonderful. I have lived here on the east coast of Australia for 30 years and prior to that in Southern Africa also for 30 years and was totally stumped. Hope you and your family have a wonderful Christmas. Thank you for your reply to my query about how to add photos. Here is a photo of the bug which l finally identified as boreoides subulatus. Thanks so much for submitting your high quality image of a flightless female Soldier Fly from Australia, Boreoides subulatus. The first time we received an image of this species, it created quite a stir in our offices. I’m wondering what this insect is. I have found several outside my house. Do they fly? Are they harmful? What are they? Your unusual insect is Boreoides subulatus, a flightless female Soldier Fly in the family Stratiomyidae, subfamily Chiromyzinae, and the last image we posted of this unusual insect was allegedly sighted in the UK. Thank you so much for getting back to me. Very interesting. What’s This Australian Soldier Fly doing in England??? For now, we are calling this by the oxymoronic name of flightless Fly. We are certain it is in the order Diptera, but beyond that, we cannot say at this time. 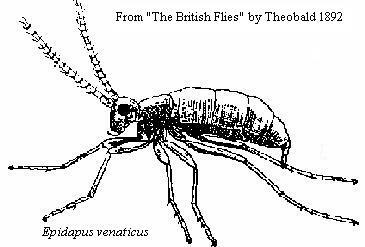 It does not appear to be the flightless Crane Fly Epidapus venaticus that we found pictured on the Earth Life Web Fly Page as the antennae are quite different from the linked drawing. We are going to seek some other opinions. Your doubt has its merit, this is not a crane fly and I don’t know off hand who she is. I will need to ask my colleague about this one. Could you provide me with the information as where this lady is from? Please double check with your source, my friend does not believe that this fly has an European origin. My colleague Dr. Martin Hauser from California Department of Food and Agriculture has identified your wingless fly as a primitive soldier fly Boreoides subulatus (family Stratiomyidae) from Australia, and they are found only in Australia. Perhaps your source did not understand the importance of locality of the bugs when come to identification. I have done a little more checking around and noticed that you had a webpage about this wingless fly. They might look slight different but I think it is caused by the camera angle and lighting effect. Thanks so much for the response Chen. We will try to get some verification from Kelly regarding the location of the sighting, and also if anyone in the area recently returned from Australia. I looked this up online myself and came to the same conclusion as Martin Hauser, but did not reply because of the locality being the UK rather than Australia. What is this bug? Is it dangerous? We’ve been finding these bugs all over outside and my little boy has been playing with them. I just need to make sure they are not dangerous since they are all over the place lately. In January 2007 we received a similar photo from Australia. We knew the creature was a fly, but we were uncertain if it was wingless or if the wings were somehow lost. We eventually learned it was a wingless female fly in the Soldier Fly subfamily Chiromyzinae. At that time, there was no information available on the internet. Now we located a Tree of Life web page posted in 2008 that states: “Chiromyzinae is an unusual group of soldier flies as the larvae are predominantly phytophagous, with many species feeding on the roots of grasses (James 1981; Oosterbroek 1998).” These wingless Soldier Flies are harmless.